We bade our farewells to Phitsanulok early yesterday morning. Well not literally, because they probably wouldn't have understood us anyway. We had another 5 hours on a train to get to our next destination, a place called Ayutthaya. This is the last major town now until we reach Bangkok (which is less than one and a half hours away from us), although Ayutthaya didn't exactly feel like a heaving metropolis when we got to our chosen guesthouse for the evening, a place called Wiengfa. We arrived there at around 3pm, but didn't venture out after that on account of the thunder, lightning and sheets of water that came down. This wasn't a big problem, though, as the room was a nice one by recent standards, and even boasted a fridge (this is the first room we had got in Thailand with one, so I made sure to take a walk to a 7-Eleven later and stock up on cold drinks - might as well make the most of it!). With the weather improved again today, I hired a bicycle from the guesthouse and did my 'survey the area' thing, try to get a sense of scale of the map we had for the town and turn those distances on paper into something real. I managed to complete a general loop of the town, noting down the prices people were charging for laundry, bike hire and boat trips, trying to spot an Internet place and so on. In doing so, I also stumbled past a few of the old ruins that Ayutthaya is known for. Although I knew that Manda and I would come out and see them together some other time I still took some photos. Well, you never know when the weather's going to change here, so it's best to grab a photo while you can. I also passed a place marked on the map as 'elephant show' but I couldn't see that any show was taking place; there were, however, easily 30 or more elephants standing under sun shades, all dressed up in red and gold, as were their 'drivers'. They didn't appear to have much to do, and when I enquired about the price I discovered it was 400 baht for a measly 20-minute walk around the town (not the best value as Thai rates go). 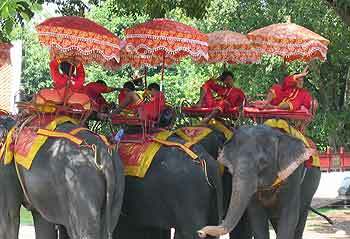 The elephants of Ayutthaya wait to take their next customers around the town's sights. I also took the opportunity of checking out other guesthouses that were listed in the Lonely Planet while I had a bicycle at my disposal. The Lonely Planet is a definite must-have for travels of this nature, but it's not fool-proof. It's written in such a collaborative way that you can never be 100% sure of the accuracy (just check out the thanks page at the back, I mean pages, that list all those who have helped contribute or clarify one fact or other). Our guesthouse that we'd picked was indeed a nice one, but it really was in a crappy location, and we couldn't have known this from the description in the Lonely Planet. Just before I headed out on the bike, Manda and I had taken a ten-minute walk down the road from the guesthouse to find the only restaurant nearby that was open for lunch, then waited 25 minutes for a couple of very ordinary dishes to be served by a very bored-looking waitress. We needed to have a little bit more choice than this. Thankfully, I managed to find a great guesthouse called Tony's Place that was in a much better location, near to shops, an ATM, had its own eatery downstairs and nice rooms to boot. Even so, I looked at a couple of others, including the U-Thong Hotel which was really grotty in comparison (amazing to think that it actually cost more for an 'equivalent' room there!). Tony's Place seemed like the best option for our next few days here. Besides, they had a well-looked-after VW Kombi parked outside with 'Tony's Place' adverts down the side, so they got my vote on that front. Apart from my trip around the town on bicycle, we didn't do anything else today. Predictably, when the sun started to dip, the rain started and we found ourselves once more 'trapped' in the room of our guesthouse in the middle of nowhere. We promised ourselves that tomorrow morning we would get up early and make our way straight over to Tony's Place.